Welcome ANN LEONARD and the Compact Team. This program has been a “pet” of our Club for a long time. ANN continues to play a major part in the ongoing operation, representing the Redlands Unified School District interests in the joint project with the business community. CRAFT TALK: Our own SHARYLIN HAMILTON, will discuss her interesting career and insights into her new work in fundraising for the School of Theology in Claremont (for those of you interested that is the successor institution to the Methodist School of Theology at USC, its founding denomination, when they booted it in 1956). *Important Announcement: Today we meet at the First Methodist Church whilst the Masons rework the flooring in our meeting room. JIM NOLIN REPORTS that the next Breakfast and A Book events at Franklin School will take place on Wednesday, 28 September and at Lugonia School on Thursday, 6 October both a 7am. Contact VICTORIAL MARSHALL to be involved. One of our best Rotarians who’s contributed so much to many projects including Red, Wine and Blues, DAVE WILSON, is moving the “city of fountains,” Kansas City. We thank him for his companionship, kindness, sense of humor, and enriching our membership. All good wishes to you, DAVE. We welcome Salvation Major MARIO REYES as our newest elected member of the club. His sponsor is JOE HORZEN. Our “Young Professionals” are hosting a service project at Community Field and will involve painting. According to one of the young, JOE HORZEN, all of the rest of the old goats and goatesses are welcome to join in: a rare chance to mix with the generations, not over cocktails, but paint. Dished up ice cream after lunch last week was a hit…JIM PINDER crammed in double scoops in a small bowl that literally overflowed with sweetness….Not to be outdone ex-prexy NATHAN GONZALES placed a double scoop piled high and large on a cone. Believe it or not none of it spilled even though it took him through most the talk to finish it…. Today we have changed much in the sartorial nature of the club. Casual is largely in and while the business suit is always present, it is clear that times have changed. In the recent Rotarian magazine, Vol. 95, No. 2 there is a sidebar how becoming a member has changed. Rotary Clubs now have more options for attracting members and keeping them involved. New member club options have been instituted by representatives from districts all over the world. They include: Structure meetings however it likes as long as it takes place at least two times a month. Want service events and socials to count as meetings? No problem. Prefer to offer both online and inperson meeting options? Go for it? Attendance policies while still reported to district can now be made flexible to tighten or loosen rules. Invite Rotaract members or young professionals to join at a lower financial and time commitment. Relatively few Rotaract members join Rotary when they turn 30. This may facilitate Rotaractors transition to Rotary clubs. Change by-laws to offer additional membership types such as associate, corporate, or family. Colleagues of the same company may now join as corporate members who alternate attendance at meetings. Many of the old boys from the past would be shocked. I am one of those and am “shocked” pleasantly that our great worldwide associate evolves to make sure secure members who help keep service above self. Do you know your Rotary History? The First Rotary Service Project….Flushing with Pride! Early on, Harris realized that Rotary needed a greater purpose. 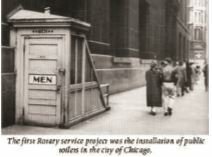 While Harris served as president of the Chicago Rotary Club in 1907, the club initiated its first public service project, the construction of public toilets in Chicago. This step transformed Rotary into the world’s first Service Club.